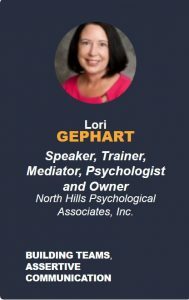 I am the president of North Hills Psychological Associates, Inc., a licensed psychologist in practice since 1990, a Collaborative Divorce Coach, Family Mediator, Collaborative Marriage Planning Coach, Speaker and Trainer. My passion is teaching team building, peaceful conflict resolution and difficult conversations to individuals, couples, and groups. I received my Master’s degree in psychology from Duquesne University. I am experienced in a variety of therapeutic approaches, and have worked extensively with children, teens, adults, couples and families. I offer psychotherapy with adults, couples and families. Because I believe that families don’t belong in court I focus on helping to bring more peaceful conflict resolution to families, businesses, and groups. Call today to schedule a FREE 30 minute consultation to find out if any of my services including the Collaborative Divorce Process, Collaborative Marriage Planning, Family Mediation and Professional Consultation may be right for you. Call 724-759-7514 or book online here. I am a Speaker and Trainer offering presentations and trainings on a variety of subjects. In addition to managing NHPA, I work as a Collaborative Divorce Coach, Collaborative Marriage Planning Coach and a Family Mediator. I am dedicated to educating others about the Collaborative Divorce Process and helping individuals and families to work through their differences without going to court. This includes divorcing couples and parents, blended families, adult children, heirs, businesses and others in conflict. My memberships include: International Academy of Collaborative Professionals (Board member 2016 to present, Secretary 2018, Practice Group Development Co-Chair 2018, Website Development Task Force chair 2017, Bylaws Co-Chair 2017 to present, Strategic Planning Task Force member 2016 to 2017, Domestic Violence Task Force member 2014), Collaborative Law Association of Southwestern Pennsylvania (President 2015 to 2016, Training Committee Co-chair 2012 to 2014, Board member 2018), Academy of Professional Family Mediators, American Psychological Association, Pennsylvania Psychological Association, Greater Pittsburgh Psychological Association (Board member and Treasurer 2006 to 2009), National Association of Masters in Psychology and National Association of Cognitive-Behavioral Therapists. As a Collaborative Divorce Coach I work with couples in the Collaborative divorce process to have a healthier divorce for themselves and their children. I work as a peacemaker to help to build trust and improve communication and co-parenting skills. The Collaborative Process offers support from a team of professionals to help couples navigate the legal, financial, emotional and parenting aspects of separation and divorce with dignity. If you are considering divorce or separation, consider the Collaborative process to avoid the adversarial approach. I am also a trainer in the Collaborative Process. For more information regarding the Collaborative Process click here or visit the Collaborative Law Association of Southwestern Pennsylvania website (CLASP) or the International Academy of Collaborative Professionals website (IACP) for more information about Collaborative Divorce or the Collaborative process. Listen to a description of the Collaborative Process. 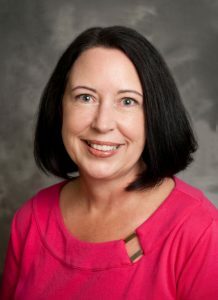 Listen to a Pennsylvania Psychological Association Ethics and Psychology podcast about the Collaborative Coach where I was interviewed by John Gavazzi. Collaborative Marriage Planning helps couples apply the effective Collaborative Dispute Resolution process to develop a marriage plan and partnership agreement offering the skills to build a healthier relationship. Appointments are available in our offices in Wexford and Robinson Township. Family Mediation is available to assist families who are in crisis, new parents, and adoptive parents who need help coping with a difficult situation or transition. Speaking: I am always happy to speak to groups of any size. I enjoy leading Retreats and facilitating conversations.